A recidivist is a person who is released from prison and who later commits another crime, or reoffends, such as a parole violation or the commission of a new crime. Recidivism rates by state vary but California is among the highest in the nation. According to a 2012 report by the California Department of Corrections and Rehabilitation, just over 65% of those released from California’s prison system return within three years. This number has not changed significantly over the years. The report also sheds light on some factors that affect recidivism including the fact that 73% of the recidivists committed a new crime or violated parole within the first year of their release from prison. Also, those convicted of property crime are much more likely to recidivate that those convicted of serious crime. Such high prison recidivism rates represent a complete failure of the prison system to achieve its supposed goals of deterrence and rehabilitation. Recidivism is a multi-tiered problem with no easy answer. Many factors go into a former inmate’s decision to re-offend after release. 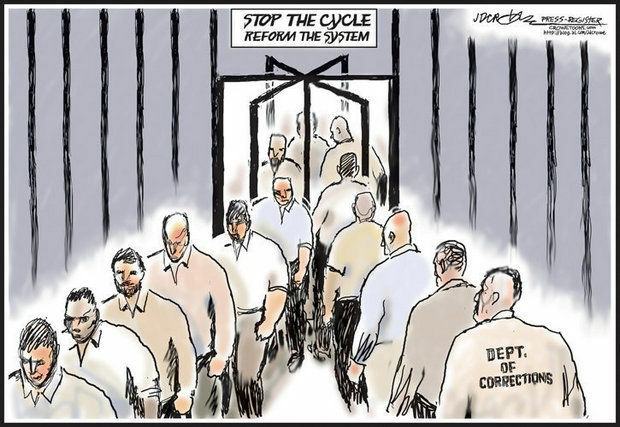 It is important to note, however, that there have been many studies showing prison programs systems which provide institutional programming have lower recidivism rates among those who are released. Prison programs such as anger management, vocational skills training, educational opportunities, and even trauma support groups are vital to ensuring inmates who are reintroduced to the general population have the life skills necessary to stay on the right path. For example, participants in prison substance abuse programs recidivate at a much lower rate than those who do not participate. Rates of recidivism are also affected by the reentry services provided to each person released from prison on parole or as a result of a determinate sentence. Reentry projects report that 33% of all prison admissions nationwide are due to parole violations. To reduce recidivism, communities need to consider factors such as the threat of homelessness, mental health services, substance abuse programs, adequate health care, education and employment assistance, and family support. In addition, female inmates may need programs and services that are different from male inmates. Unfortunately, however, California is one of many states which have stripped its prisons of rehabilitative programming over the years. Legislators and special interests who shape the institutional model for California’s prison system have decreased funding, or defunded altogether, programs which are designed to rehabilitate the prison population by arguing such programs are “soft on crime,” including parole services. As a result, inmates are often unable to participate in programs even if they are interested; wait times for valuable programs can be months or even years. If the system is supposed to work to deter those convicted from committing crimes again and rehabilitate them so that they can become productive members of society upon release, it is clear that the system is doing something wrong when two-thirds of those released ultimately return to prison. The prison system needs to address these recidivism rates and make the changes necessary to meet its goals: deter and rehabilitate.